This is one of my son’s favorite meals when we dine out. We usually get it as an appetizer at TGIF’s. They make such amazing food, but after a while, it becomes a bit draining on the pocketbook. Now, that I am armed with my air fryer. I vowed, that I would spend less money on takeout and try this month, start recreating classics at home. Since my kids are teenagers, they are always hungry and always looking for something to eat, so they don’t mind eating my failures. I tried three times to get this recipe correctly. My youngest son, Jason absolutely loved the BBQ chicken flavor, my other son, wanted to know if I could make a pepperoni one for him. I laughed and told him that that’s no on the menu for today, but I’ll be putting it on my menu for next week. So, if you like a great Pepperoni flatbread, check me out next week. So, the first thing to remember when you are making any sort of flatbread is you need to start with the perfect crusts, the right building block for your pizza, flatbread or calzone. My favorite brand is Mama Mary’s, which has the correct balance of size and firmness for the air fryer. 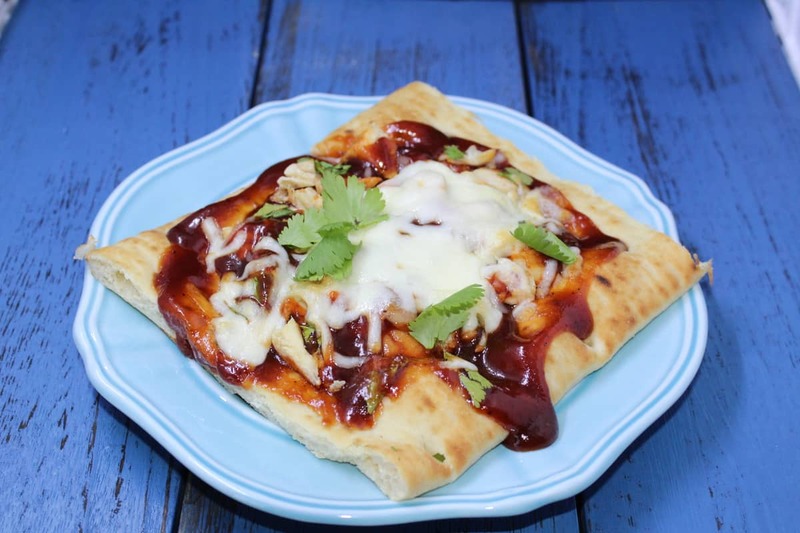 Another great thing, when you make flatbread or pizza’s at home, is that you can make them suit your lifestyle, gluten-free, KETO, low carb, etc. 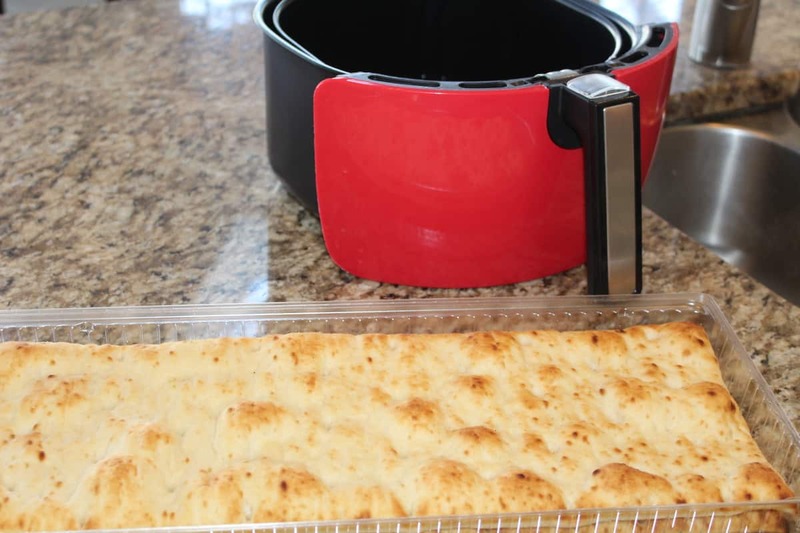 As most of you know, my loyal readers, that my oldest son has a gluten allergy, and I get many suggestions for bread, dough and other products for a good gluten free product, my favorite gluten-free flatbread crust is, Against the Grain. I find that it stays firm, but tasty at the same time. There is nothing like a hot pizza or flatbread directly from the oven, it’s nice hot and gooey. It has the right combination of soft and chewy. It tastes amazing out of the oven. I hope that you and yours try it, and loves it as much as me and my family. 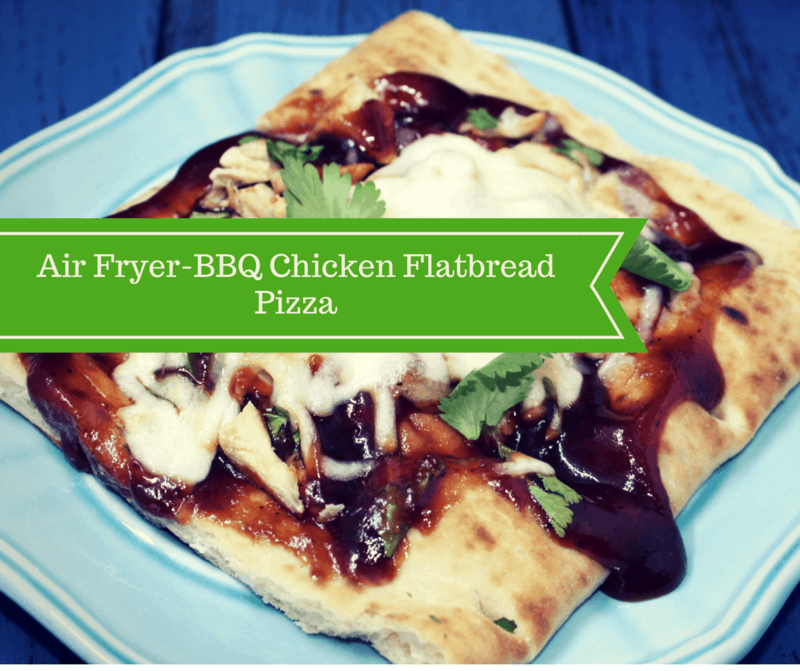 Note: There is no way that this flatbread is going to fit in my air fryer. 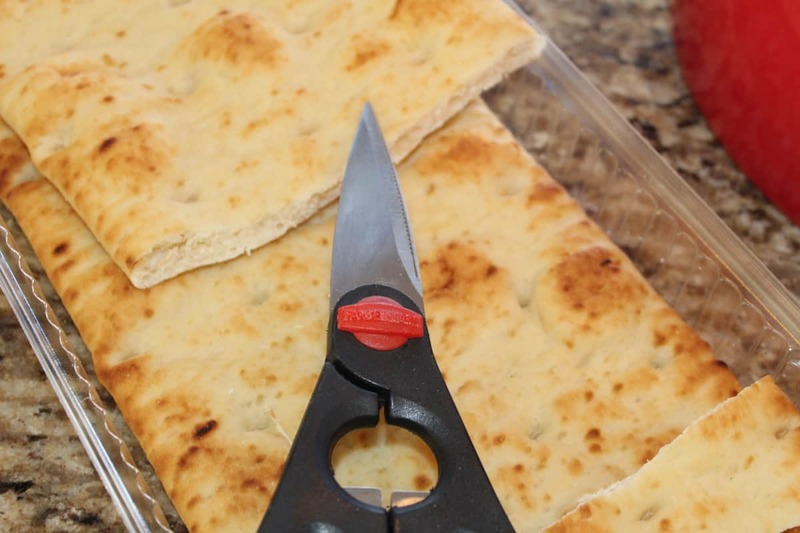 So, I cut it, with my trusty scissors, if you don’t have kitchen shears, that are dedicated to your kitchen, pick up a pair. In a small bowl, mix together the chicken and the cilantro. 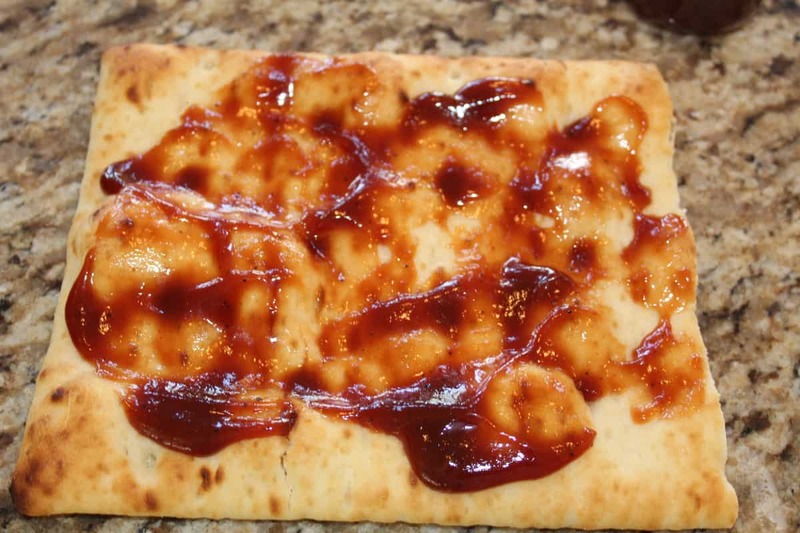 Spread your BBQ sauce directly on the flatbread. Then garnish with the chicken and cilantro. 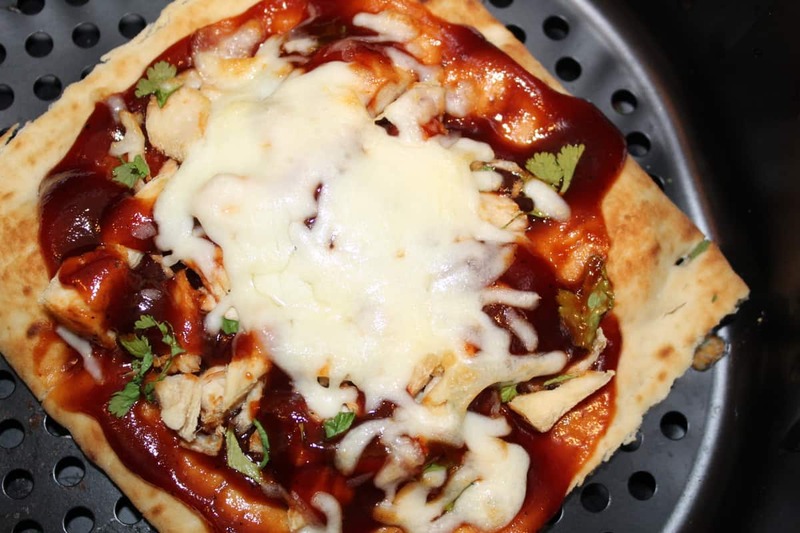 Then place the flatbread in your air fryer, and sprinkle mozzarella cheese over it. Completed flabread, doesn’t it look yummy! 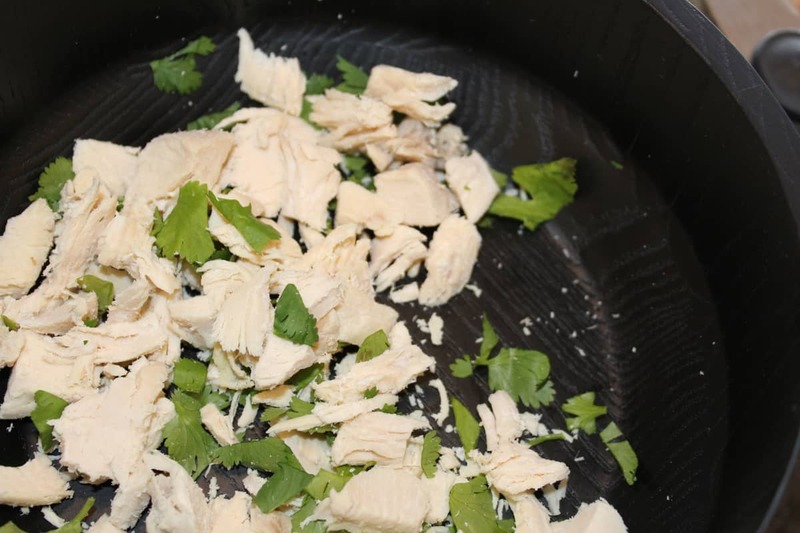 Start by preheating your Air Fryer to 200 degrees C or 390 degrees F.
Start by prepping your ingredients, shred the chicken and dice the cilantro. Then mix the cilantro and chicken together. Then decide on the optimal size of the flatbread, if the piece fits, you don't need to do anything. 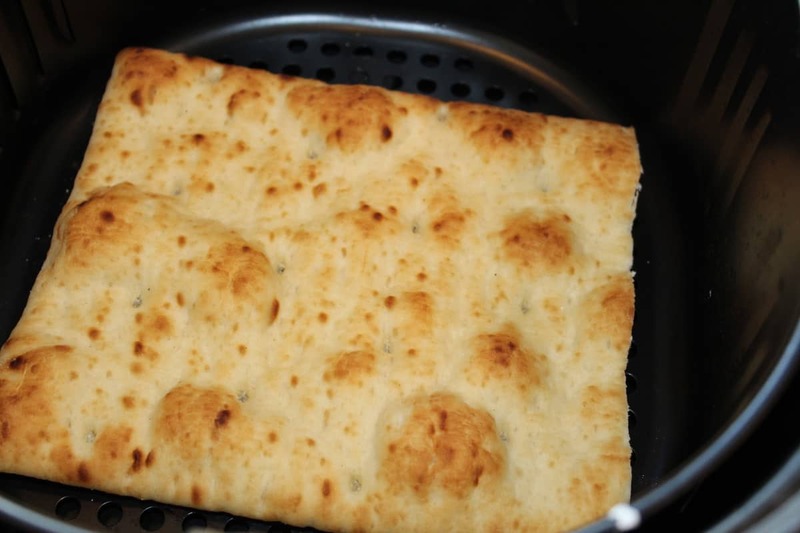 Otherwise, cut the flatbread so it fits inside the air fryer. 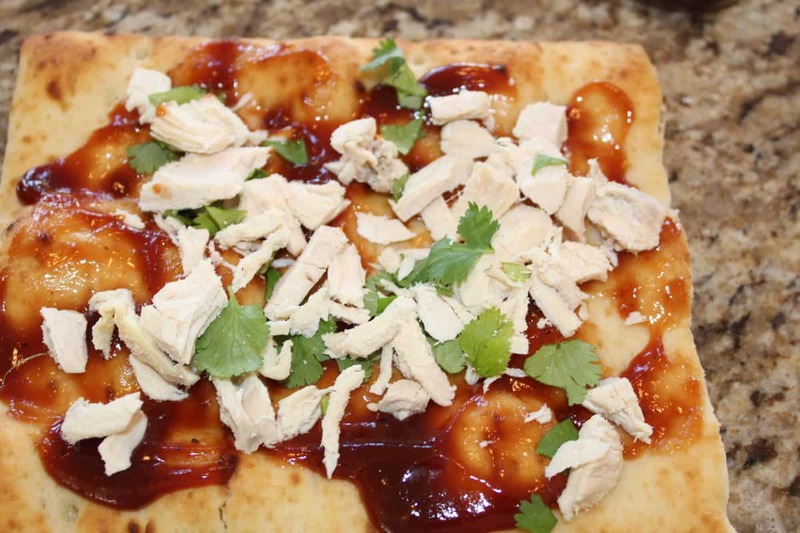 Spread the BBQ Sauce over the flatbread pizza crust. 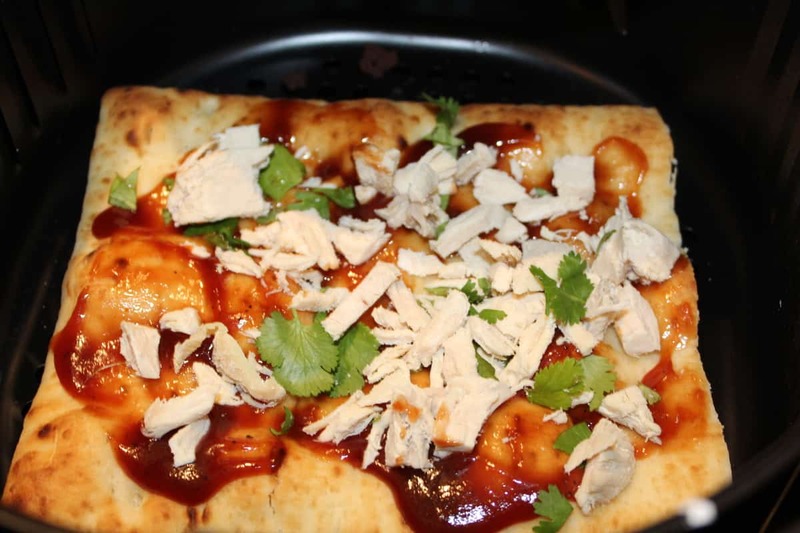 Then sprinkle the chicken mixture over the BBQ sauce, and then spread the mozzarella cheese over that. Then set the time for 5 minutes. 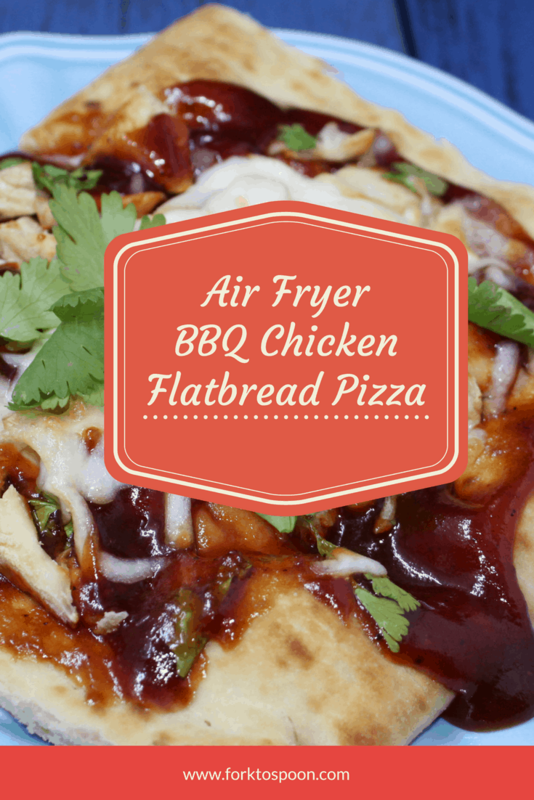 Note: The actual time will depend on the flatbread used, and the wattage of your air fryer. Tip: For perfect cooking, check frequently.